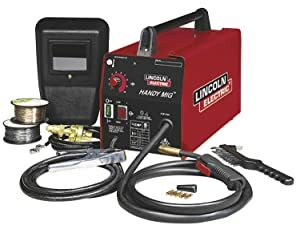 Best Cheap Welder Review in 2019: Buyer's Guide! Which Cheap and High-Quality Welders Should You Pick? If you are looking for a welder, there is a great choice of various products with different features; s, power consumption, dimensions, weight, and purposes. As long as welding is a complicated process that requires certain skills including safety, you must have some knowledge on how to use a welder, whether you can use it in a house or flat, and what materials can be welded. I found 6 amazing welders at reasonable prices that will suit various purposes and are worth to buy and keep on one of the garage storage shelves. 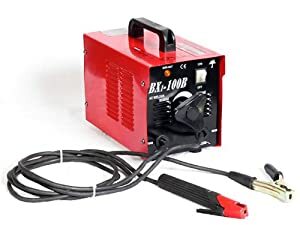 In the list, you will find portable, comparatively light welders with many useful features including displays, auto overheats protection, etc. Some of the welders that we are going to show you do not need gas and can operate just by being plugged into a regular outlet. This welder is made of 100% metal. The welder may come in different colors and have different features. 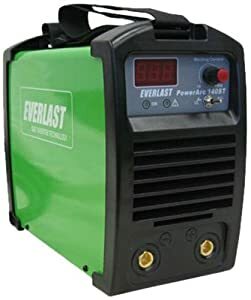 This welder provides such features as Voltage: 110 Volt – Frequency: 60 Hz – Required Current: 26 Amp – Single Phase – Amperage Control: 45 To 100 Amp – Welds Up To 1/4″ Mild Steel – UL Listed – Up To 100% Duty Cycle Includes: 1 Pc Welders Shield 1 Pc Stinger. The welder is not very heavy – 28 pounds, so you will be able to take it and carry. It is easy to handle and transport it. The item is compact with dimensions 18 x 13 x 1 inches, so you will be able to take it in a car. Pitbull Ultra-Portable is perfect for home projects as well as maintenance. The welder does not work for stainless steel. The product comes without welding sticks. It provides great work without breaks for its price. 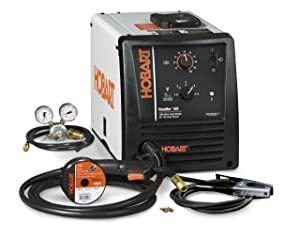 This is quite a costly but professional welder that works on up to 1/8″ mild steel. The product welds shielding gas, sold separately and flux-cored. You can plug the welder into household 115V, 20 amp outlet. The welder has 70 Amps. The welder is compact, its dimensions are 18 x 11 x 17 inches, lightweight – 49 pounds, therefore, you will be able to work comfortably and take it to work. The welder is the right choice for home repairs and hobby projects on light gauge mild steel. The product comes with an adjustable wire feed speed control, 6 ft. power cord and 8 ft. clamp cable, welding gun and cable assembly, work cable with clamp, a gasless nozzle for flux-cored welding, gas nozzle, gas regulator, hose for MIG welding, 1-lb. spool of 0.035 in. flux-cored wire, 2-lb. spool of 0.025 in. solid MIG wire, three 0.035 in. contact tips, three 0.025 in. contact tips, welding hand-shield and chipping hammer/brush. This welder comes at a reasonably affordable price. It is perfect for outdoor use because it does not provide an external shielding gas. The flux built into the wire shields the weld. It is best to use it for gasless flux-cored welding on thicker steel. 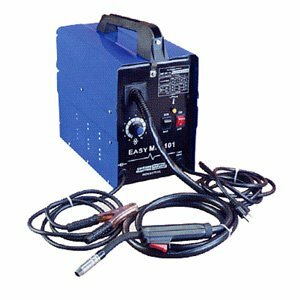 The welder is 120-volt flux and allows you to work on material from 18 gauge to 3/16″ thick. The product comes with a self-shielding flux-cored welding wire. You do not have to use shielding gas to be able to weld. The welder has 20 amps, single phase 60 Hz. The wire capacity: 0.030″/0.035″. The product comes with 2 lb. spool of flux-core wire. Manual is included. Its dimensions are 21 x 13 x 15 inches, weight 39 pounds. This is a perfect model if you want to learn how to weld. It is not complicated in use, it is well-designed and perfect for starters. 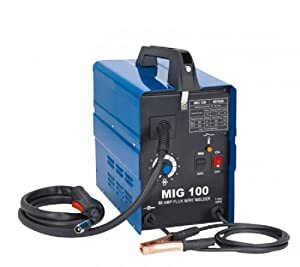 This is a great and useful 90amp wire feed MIG welder. It is compact, its dimensions are 14.5 x 14 x 14 inches, it also lightweight – only 33.1 pounds. The welder perfectly suits work at home, garage, or your hobby projects. The product is a non-gas and operates off a standard electrical plug. This is a complete unit (kit) that does not require any extra tools. The welder comes with flux wire with a welding mask, gun, ground clamp, welding hammer, brush and even a carry handle. It has an auto feed dial which is adjustable. Its welding Amp range is 55-90, input 20VAC Single phase, power 60Hz. The welder works perfectly up to 1/8″ thick mild steel except for aluminum. The additional feature of the product is auto overheat protection. The welder will operate when plugged into a regular outlet. This is one more costly welders, however, its smooth work will impress you. If you are planning to do various projects at home, this is a great purchase. The product is stable, smooth, and needs a low power consumption. The item is considered industry standard for class 35% duty cycle at rated amps. The welder is portable – is it only 24.8 pounds. The product provides an automatic hot start for reduced electrode sticking. A digital display will allow you to easily set the welder. The item has DINSE 25mm style connectors for easy connection. Best for steel and stainless welding.17V series with a manual gas valve built into torch handle. It provides a Dual Voltage 120/240V. Its dimensions are 20 x 12.5 x 13.5 inches so you can transport and carry it. This is the most expensive welder on the list of the best welders for the money. Its high price is reasonable due to its highest quality and perfect durability. This welder is Hobart’s most popular wire feed welder. There are no tools and kits required for excellent work. The product is one of the heaviest – 65.3 pounds compared with other products from the list. Still, it is portable, its dimensions – 19 x 11 x 13 inches. You will easily transport it. The welder provides a great arc performance. After purchase, you will need only a few minutes to set-up to make the unit ready for welding. The welder operates on standard 115V household current. This was a comparison of 6 greatest welders on the market that you can purchase online at the best prices. Chose the welder that suits your requirements and materials you are planning to work on.